This no-cook, summer salad uses seasonal fruit, vegetables and nuts for wonderful texture and flavour. 1. 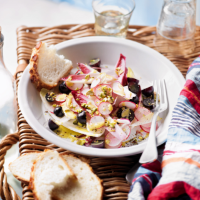 Mix together the chicory, nuts, grapes and radishes. 2. Whisk the lemon zest and juice, mustard and oil and toss into the salad with some seasoning. Serve with crusty bread.